The game can be played by one player, when no one else is available to play, but also with up to 4 players. 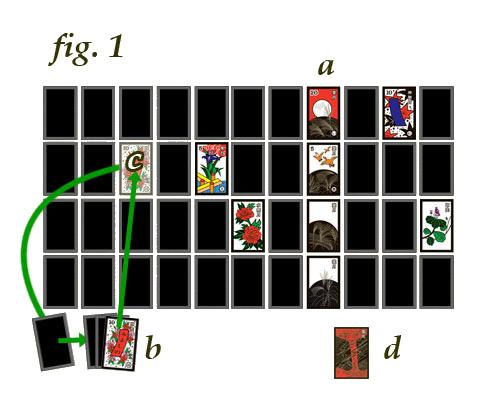 The objective of the game is to flip over all 48 cards, face up, in rows, according to the same flower or month (fig.1a). First, line up all 48 cards face down on the table, or tableau, in 4 rows by 12 columns. Take the last column of 4 cards from one end. Keep these 4 cards in a separate pile, turned face down. This becomes the stock, or drawing stack(fig.1b). A player upturns the top card from the stock, and exchanges it with any of the 44 cards in the field. The card from the stock is placed upturned in the field, and the card from the field goes under the bottom of the stock (fig.1c). The goal is to line up each column by suit, or hiki(fig.1a). Any four cards of a suit can be in any order as long as they are all from the same suit. If a player picks up a card from the November (Willow) suit, the November card is taken out of play, and placed face up in a separate stack (fig. 1d). Every time a November suit card is revealed the drawing stack is reduced by one card. If there are multiple players, the person who revealed the November card loses his turn and the next player takes the stock and begins to exchange any of the cards in the field. If playing solitaire, the player can continue exchanging cards until all four November suit cards are revealed, and the stock is reduced to zero. The game ends when the 4 cards of the November suit have been revealed, and there are no more cards in the stock. The player wins if he successfully flips over all of the cards in the field and lines them up by suit. * A more difficult version (after players master the easier version) is flipping over the entire 48 cards by highest value, top to bottom, and months, January to December.